This is the page of our website where you will find everything that we have on sale. 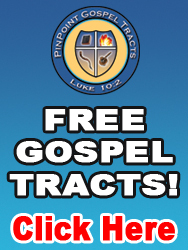 Sometimes we will have gospel tracts on sale. Other times we may have gospel signs, gospel sandwich boards or other items on sale. We always want to give you the best prices, in order to equip you to reach the lost in the most effective way possible. We want to be a blessing to you!